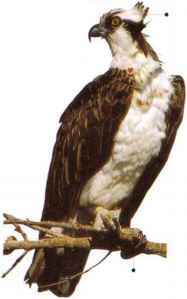 Often soaring over lakes, rivers, and coasts, the Osprev is a fish hawk, swooping down to take its prey from the water. It plunge-dives with feet first and wings raised, often submerging itself almost completely, to reappear with a fish and continue with its flight. The prey is usually carried head forward, held in both feet, to be eaten on a tree branch or on the nest. • NEST A mass of sticks placed on a tree, a seashore, a crag, or an artificial nest platform. • DISTRIBUTION Breeds in North America, Eurasia. Africa, and Australia. Winters in South America, Africa, and Asia.